There are few things prettier than a manicured front lawn—especially one that is stunningly green. Grass that is rich, thick, and well-maintained can make any yard look lush and inviting. However, there are just as many reasons for homeowners to not choose grass for front yard landscaping—most of which are practical, some of which are purely personal. For example, grass consumes a lot of water. In some cases, it can contribute greatly to chemical runoff. This means that in places like California, where droughts are widespread and water can be scarce, growing and maintaining a full grass lawn is simply not practical. In such cases, grass alternatives may be the better option. They can help you conserve water—and consequently save on your water bill—eliminate the need for chemical fertilizers, reduce the pest population in your yard, and won’t demand too much of your time and resources for maintenance. That being said, here are three great grass alternatives for front yard landscaping, and some important things to note about them. 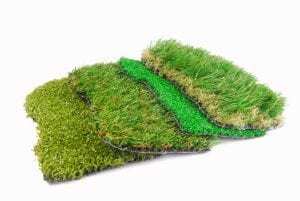 Perhaps the best alternative to grass would be synthetic or artificial grass—also known as turf. You get the same look and texture as natural grass without any of the extensive maintenance. One of the biggest selling points for turf is that it can’t grow or wither, which translates to a yard as fresh and perfectly manicured as the day it was installed. There are typically three types of synthetic grass to consider: nylon, polypropylene, and polyethylene. Nylon is perhaps the best choice for lawns that are expecting a lot of wear and tear i.e. foot traffic, children playing, the occasional vehicle, etc. It’s durable, able to maintain its shape, and can withstand extreme temperatures. Polyethylene is a bit softer, but it’s arguably the most vibrant of the three. It can also hold its own against foot traffic, although not as well as nylon. Polypropylene is the cheapest of all three, but is not as resilient or as colorfully rich as its counterparts. Pros: Literally no maintenance needed. Get the same rich green look of a real grass lawn without the need to weed, trim, and spray every month. Cons: Low-quality synthetic grass can look fake from miles away, and can therefore come off as a little tacky. Make sure to always get high-quality turf. For spacious dirt yards, why not invest in permeable gravel and gorgeous stone walkways? Plant some drought-resistant shrubs in the middle and then install pavers or stones to mark paths in and around your garden. The initial investment may be a bit more costly than a vegetable garden, but less foliage to take care of means more money saved on water and fertilizer. Permeable gravel will also keep rainwater from running off into the street—instead, it will allow it to soak into the ground, providing your shrubs with adequately moist soil. Pros: Maintaining stone walkways is much easier and much less costly than maintaining grass lawns. Cons: You will be paying a lot more for materials, supplies, and labor during the initial front yard landscaping if you choose to install permeable gravel and stone. If you want your front yard to truly shine, invest in a water feature. Waterfall, fountain, oasis, koi pond, pool … your options are pretty endless! Believe it or not, you can still save more water by investing in one water feature rather than a full lawn of real grass. Front yard landscaping means you can combine your water feature with hardscape elements to create a truly stunning picture. Install a marble fountain in the middle of your lawn with stamped concrete pavers leading towards it, or complement your koi pond with a Japanese rock garden to create a meditative, quiet space. Pros: Water features are incredibly versatile and very eye-catching—especially if they’re used as a focal point in your design. Cons: Maintenance is a bit extensive and can easily take up your morning or afternoon. Running water like fountains or waterfalls are a bit easier than ponds or pools, since the water is constantly flowing. If you’re not a hundred percent sure, always call a professional to handle it. Want to learn how to waterproof your hardscape features? Here’s a guide! As far as front yard landscaping is concerned, grass is a nice touch, but it’s not your only choice. These alternatives can help you transform your dirt yard into a fully beautiful, fully functional front lawn. Just pick the one that has the best pros for you and carefully judge whether the cons are something you can handle.